Now maybe it's just missing from his IMDb page, but I wasn't aware that The Crow, Dark City and I, Robot director Alex Proyas held advanced degrees in cosmology, astrophysics, thermodynamics, and quantum mechanics. Of course, you don't have to be Stephen Hawking to make a thought-provoking science-fiction movie as Steven Spielberg has proven numerous times over. However Proyas’ film Knowing-- which begins with an incredibly intense, pulse-pounding first hour, unfortunately hurdles towards one of the most ludicrous, unintentionally hilarious, and downright bizarre conclusions in recent cinematic memory. In fact, it so derails its audience-- that had been previously and wholeheartedly committed to the far-fetched but fascinating storyline for a good majority of the picture-- with one of its roughly baker’s dozen silly finales which makes his announcement that he believes his film is completely steeped in reality all the more mind-boggling and a bit worrisome. Uneasily venturing from its The Shining meets The Ring freaky little kid origins into a doomsday drama a la Deep Impact before it tries to weave in Mothman Prophecies and Dragonfly New Age spiritualism to the horror-lite psychological thriller Final Destination—Knowing leaves no genre or device behind sprinkling in some Close Encounters of the Third Kind in for good measure amidst a generous helping of The Twilight Zone. And unfortunately, in hindsight, it definitely didn't need to be that way as the film begins with an eerie and ominous beginning going back in time to 1959 as we meet a young girl who participates in a grade school burial of a time capsule to be dug up 50 years later. While the other students in Lucinda's class predictably draw pictures of spaceships in their foreshadowing of what life will be like in 2009, Lucinda obsessively puts pencil to paper and begins writing numbers in a frantic frenzy filling both sides of one single sheet before her teacher pulls it away from her. However, Lucinda hadn't finished her project as we quickly discover on the day of the time capsule burial when the peculiar girl disappears from the crowd and is later found scratching until her nails are bloody more numbers into the wood of a school closet door. Fifty years later, Lucinda’s sealed, buried envelope is opened by Caleb (Chandler Canterbury)—conveniently the son of MIT astrophysicist John Koestler (Nicolas Cage). Although his son isn't supposed to bring the envelope home (following the ceremony that unearthed the time capsule), something about the numbers inspires Caleb to do the opposite as he later tells his father that the sheet could contain some sort of math puzzle. As equally headstrong as his father-- the young hard of hearing Caleb comforts himself with Discovery Channel specials and old home movies of his deceased mother. Yet, fiercely devoted to protecting his son almost to the point of making Caleb a near shut-in when he isn’t in school since he can’t bear to lose the rest of the family either to death or disagreement as-- John copes with the absence of his wife with increasing amounts of Jack Daniels and classical music. However, in a drunken whim, he becomes as equally intrigued as Caleb was by Lucinda's numbers. Ripping a white-board down off of his wall when he realizes that patterns have begun to emerge and after an insane amount of Google searches, Koestler realizes that what-- to an untrained eye would just seem to be the nonsensical automatic writing of a lunatic-- actually foretells the dates and casualties of ever major tragedy including the latitude and longitude of each event. When he realizes that the Phoenix, AZ hotel fire which took his wife away is also included in the message, he takes his discovery to a colleague in the cosmology department who remains not only skeptical of the paper but fearful of his friend’s mental stability. However-- sticking to his guns (or rather brains)-- John remains increasingly convinced by its authenticity especially when he personally witnesses two upcoming disasters conveniently located within driving distance. It's in these two horrific scenes of startling intensity and state-of-the-art special effects that Proyas shows that he is an incredibly stylish filmmaker with a noir flair, keen sense of the dramatic, and master at weaving all of the pre-production, on-set, and post-production elements together for the most incredible impact. 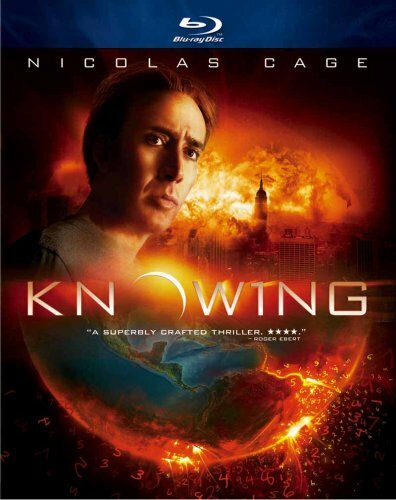 Knowing's sequences are unbelievably dazzling to the senses. Freeing up the filmmakers to move much faster than the usual for a shoot, Duggan said that the new technology gave them “more confidence in pushing the limits of what we were doing,” by offering them the chance to do things formerly exclusive to post-production such as “tweaking color” as they were shooting directly on set. Coupling Duggan’s amazingly fluid, hyper-real cinematography with Proyas’ trademark emphasis on natural, low-lit scenes filled with dark color schemes and wardrobe such as in a phenomenal subway chase and derailment in New York City—Knowing is heightened all the more with the score from the talented composer Marco Beltrami (Scream, 3:10 to Yuma). It’s hands down the best original score I’ve heard so far in 2009. And moreover, it’s one that was so good at numerous moments-- and especially when the movie started to become increasingly nonsensical-- I found myself fixating on the work more as a moving piece of art with some truly dynamic music that managed to maximize every scene to the fullest, even when it didn’t deserve it along with the incredible photography. For example, we're soon distracted by some super lame special effects as it moves towards its laughable finale, we're distracted by a group of odd stereotypical Albino looking mystery men in long trench coats that seem to have wandered in from a 1980s music video shoot. An admirable attempt that had so much potential given its terrific set-up and original source material, Knowing seemed to have been—at least when you read the press notes—destroyed over the reported “eight years [spent] developing the script,” which had begun with the initial gem of an idea from Ryne Douglas Pearson (Mercury Rising). And accurately, Nicolas Cage compared the script to a teleplay for Rod Serling’s iconic “The Twilight Zone,” which made sense for a majority of the picture. Moreover, I felt that it would’ve been best if they would’ve stuck with that “what if?” simple yet fascinating idea of what would you do if you discovered you knew precisely when tragedy was to strike in the form of the apocalypse. However, by trying to throw in a bizarre and uneven amount of New Age, spiritual, pseudo-scientific, religious, and philosophical theses together into one movie, it ultimately just resulted into a huge mess as opposed to their original intent which was to make something “people are going to want to talk about.” Going for a weird blend of I Am Legend with a musical motif pulled straight out of Barry Lyndon-- yet with all the "believability" of Eyes Wide Shut, you'll find yourself foolishly starting to stand up several times as the final moments of Knowing goes from one would-be tease of an ending to the next. And while honestly, the timing couldn’t be worse for a movie about the end of the world given our gloomy global crises, economic situation, etc.—I’m sure it will fascinate for a good week or so at the box office especially considering the devoted fans of both Proyas and Cage until eventually word of mouth will bring it down, just as it did to those other watchers of doom-- in the recent Watchmen. And although M. Night Shyamalan and Frank Darabont's 2008 works are far from perfect, I'd say-- save your dough and rent the underrated yet still superior The Happening and The Mist and instead.